We’re just some dudes talking about some dudes who play basketball. We talk about the Oklahoma City Thunder and the NBA, in general. There are bad things to say - so many that I'm sure I missed some. But there are some good things too. Listen in for both, and Thunder Up. We're not done yet. Thunder lose to the Trailblazers 104-99 in Game 1 of their hotly contested first round series. Brady Trantham returns! Playoff preview and LOTS more! Brady Trantham joins Dylan on the pod to talk the Thunder’s regular season, preview playoffs, revisit preseason predictions, and more! Game 81 Recap - Thunder HUGE victory over the Rockets! Topic: Thunder welcomes BRETT DAWSON of the Athletic! Brett Dawson of the Athletic joins us for the first half of this episode, covering his experience and very educated Thunder opinions. We then go on to our usual Weekly, covering the week that was, the most relevant Thunder news, the AMAZING Russell Westbrook, and the most important Forecast of the season! Thunder Up! Better late than Never! Thunder best Pistons 123-110! Russ makes history.... yup, again! My sincerest apologies for the lack of timing to this podcast. Withstanding Blake. Russ in control. MVPG back? Steve strong. And more! I bask in Russell's greatness, cover how our defense led to more shot opportunities which leads to leads because defense equals offense, bask in Russell some more and get amped up a little more before playoffs. Long week, some good, some bad, some more reactions from the Mavs loss and much more! The Thunder lost again, again to a good team. It's been rough, and it's been discouraging, but there are a few reasons to still feel okay about this matchup with Denver. Wade through the sadness with us, and let's try to find some joy. Thunder Up. As always. After being down by double digits in the second half (as is the Thunder way, apparently), OKC turned on the gas for a 24-0 run. This flipped the script heading into the fourth quarter where the Thunder answered every move the Pacers made to finish this one off. Oh, and Russ rocked a few babies also! ;) Give this a listen as Matty Mulls goes through all the particulars in this pivotal win for the Thunder! Nick Gallo of Fox Sports Oklahoma and sideline reporter of the OKC Thunder stopped by the podcast to talk about pretty much everything from basketball, locker room interactions, and which jail cell is the best jail cell (disclaimer: purely hypothetical scenario). Download and subscribe for more! Andrew Schlecht of Down to Dunk Interview! Andrew Schlecht of Down to Dunk podcast joins the unit to talk all things Thunder, as well as pulling back the curtain onto his personal side! You don’t want to miss this! We came so close, and yet so far. Tyranny brings you the recap of the game following Nick Collison's jersey ceremony (I didn't cry, you cried). Please download and subscribe! No Russ, No Nerlens, Adams in foul trouble, surrendering 67 bench points? Not a great formula to win a game. JG coming up huge. Does PG have that killer instinct? Pump ya brakes, and a little playoff talk! - Live reactions from GSW loss - Thunder March Madness Bracket - Twitter TQ's Download and subscribe! Thunder had opposite day today, played well in the 1st half and bad in the 2nd, but we will move on for Saturday. On the back of Russell Westbrook (and a 24-6 run), the Oklahoma City Thunder are able to get a much needed win at home against a surging Brooklyn Nets squad. Paul George (and his heavily KT taped shoulder) helped set the tone as OKC held its second consecutive opponent to less than triple digits. Matty Mulls (@mattymullspod) is on tonight's recap! Game 67 Recap, ANOTHER ONE. Thunder sweep Jazz in 98-89 victory! Weekly 20 - Burton, Special interview with the man who reported PG's injury is worse than it seems, Brandon Robinson, OKC's The Office, and more! On this Weekly, we talk about last week in general, the signing of Deonte Burton, discuss what happened to our defense, and go over next week's Forecast. Halfway through, we welcome a surprise guest - Brandon Robinson, Scoop B - the man who broke the story that PG's shoulder injury may be more than it seems. And then for fun, we compare Thunder players to characters from the Office. Enjoy! Tough game but the boys fought hard and fell to the Clippers 118-110 in LA after a great OT game in Portland the night before. Thunder win! Thunder win! And boy did we need that one. It got chippy down the stretch, but OKC managed to grab one in Portland, SWEEPING the season series against the Blazers, and hopefully putting a rough stretch to an end. Enjoy, and Thunder Up. In Paul George's first game back from shoulder injury, he looked like it. PG-13 might need a few games to get back into rhythm and tonight was exhibit A. Russell Westbrook's 38 points couldn't keep pace with Karl Anthony Towns (41 points of his own) as the Thunder fall on the road to the Timberwolves. This drops OKC to fourth place in the standings behind (pukes) Houston and slightly ahead of Portland due to the tie-breaker. Matty Mulls catches you up on all the action from tonight's loss. We're here to bring you any and all good news... even if it's not much. Download and subscribe! Dylan and Tyranny start a new segment called "We're depressed for a minute". It was sad. Then we did the game recap. It was also sad. Thunder lose 108-104 with PG and Joel Embiid out, but it was a tight one, as they usually are, with the Sixers coming out victorious, 11 years later. Sorry for the delay, Thunder fans! We had some technical difficulties, and had to record this one all over again. But you know we're still getting you a recap every single game, so here we are! Discussing the Thunder's loss in Denver - would've been huge, but alas, nobody played particularly well. We're not so discouraged, but the next one is HUGE! Thunder Up! Matt Moore - Hardwood Paroxysm - interview. Oh! And Weekly! We here at T:T are SUPER thrilled to bring you this interview with Matt Moore of the Action Network - or as you may know him, Hardwood Paroxysm, @HPbasketball on Twitter. He's a national writer who got to spend some time in OKC, and released a suite of articles on the Thunder. Pumped to have him on, but not only that! After Matt hung up, we continued on and banged out our normal Weekly for you. Enjoy! Thunder lose a heart breaker to the Kings. Russ was brilliant in every facet of this game, but no one on the Thunder could match his energy or his efficiency. T:T Welcomes ANTONIO DANIELS onto the show for a very special episode! Topic: Thunder is thrilled to have ANTONIO DANIELS on for a special episode of T:T. We discussa bit on the fit of Markieff Morris, the importance of stability for OKC, feelings about the Anthony Davis saga in New Orleans, and guess who AD thinks is the best matchup in the league for the Warriors! And MUCH more. And oh by the way, voice messages from listeners for AD to respond to. Enjoy! T:T Weekly Ep. 18 - Live Reactions from All-Star Game! Jerry, Matty, Alex, and Tyranny join up to do some All-Star talk, some Markieff Morris talk, and even some Hami Slammy talk. @jeraldamir First time running solo on a 131-122 loss, with editing and everything, so be easy on him. He breaks out the TiVo and gives some things to look forward to with the UNIT and the OKC Thunder. The Thunder won, but we'll get to that later. Russell Westbrook just set the ALL-TIME record for consecutive triple-doubles, breaking a record set by the person whose records never are broken - Wilt Chamberlain. Paul George aslo had a triple-double, oh, and 47 points. There's too much to talk about, but we try. And we include 2 voicemails from people who we sent to this historic game FOR FREE. Wow. Thunder Up. An amazing 3rd quarter comeback down 26 points leads to an exciting 4th quarter finish you don't want to miss! We break down the highlights and the final minutes of an amazing game between two MVP candidates. Who wins? You can probably guess. Turns out Memphis isn’t as good without Marc Gasol. We breakdown a tale of two halves for the Thunder, winning against the Grizzlies 117-95. Game 53 Recap: Led by stiff (2nd half) D, OKC grabs another W against Orlando! Riding the hot hand of Paul #MVPG George (39 points), Dennis Schröder (CHOO CHOO! ), and Russell "Triple Double" Westbrook, OKC improves to 34-19 on the season. Matty Mulls (@mattymullspod) breaks down all four quarters of tonight's win! Let's just forget about this one. It's Super Bowl Sunday! T:T Weekly 16 - Trade Deadline Approaching! We decided to pretend like we are GM's, and it was interesting... Plus weekly recap, forecast, and our All Star reserves are selected for LeJerry and Tyranny(Giannis)! Paul George casually drops 10 3PT, an OKC franchise record. Schroder decides that it's best to go off in the 1st half rather than the 2nd half this time around, and Russ quietly gets another triple double. Listen to the full recap, courtesy of Matt T. and Jerry! On the back of Paul George (early), Russell Westbrook (always), and Dennis Schröder (late), the Thunder got out of the "Magic Kingdom" with a victory. This was the trap game of all trap games and it almost went that way until OKC's new guard wouldn't let the Thunder falter. Listen up, as Matty Mulls brings you ALL of tonight's action! The OKC Thunder had their best win of the year over the red-hot Milwaukee Bucks. We've got audio from the locker room in this one, from PG, Ferg, Nerlens, and Adams. We've also got the TiVo, the Unit, the PoG, and a brief Forecast. Enjoy! T:T Weekly 15 - Welcoming the new recruits! Welcome back to the Weekly! Where this week we welcome our new guys, have special announcements involving voicemails and free stuff, in addition to our usual awesome content. Enjoy! The Blazers wanted this one BAD, but the Thunder wouldn't let them have it. This was a big game, and OKC handled business at home. THIS is what we like to see. Tune in for an extensive TiVo, Player of the Game, and our favorite Unit, and more! Thunder Up! Another game, another MVP performance for Paul George. Russell Westbrook in full control of the game, shooting an efficient near Triple Double. And the Thunder gets a huge 3 point shooting boost from Ferguson, Nader, and Schröder and the Thunder win their second straight 127-109! Welcome back to the Weekly! Stephen, Dylan, and Matty recorded while watching the 4th quarter of the Thunder's outstanding victory in Philly. Tune in for live reactions to the game as we take you through last week's games, the state of OKC, and next week's Forecast. Enjoy! Paul #MVPG George said "No OT tonight." A three (and one) put OKC on the "high side" and they were able to hold onto the victory 117-115. What a dramatic win for the Thunder on the road after dropping five of their previous six. Did you miss the game? Do you just wanna hear about a Thunder victory for a change? Stephen Dolan (@SteveThunderfan) and Matt Mullins (@mattymullspod) get you up to speed on Saturday's game! Game 44 Recap - Well if you thought last game was disappointing! The Thunder lost to a very bad team, mostly because they didn't play hard. That's about it. What a bummer. We're still giving you the recap, though! Try to enjoy! Game 42 Recap - Vengeance is ours! The Thunder avenged themselves against the Spurs for their loss a couple nights before, and boy did it feel good. It's amazing how good the Thunder are when the other team doesn't shoot 80% from three! Enjoy! Unpacking an eventful night in San Antonio in wish the Thunder lose in 2OT 154-147. Dylan in the breakdown! OKC fell to Minnesota due to not being able to finish defensive possessions (15 offensive boards by MIN) and free throw differential (40-26 favoring MIN). Nerlens Noel also went down with best case scenario, a severe concussion and Andrew Wiggins continues to haunt OKC at home. Get all caught up on game 40 of the 2018-2019 as Matty Mulls takes you through tonight's action. Another triple double by Russell Westbrook isn't enough to overcome turnover, rebounding deficiencies against Washington on Sunday night. If you want to know how in the world this happened, give us a listen as Matty Mulls gets you all caught up on the action. Game 38 recap - Thunder finally get one in Portland! 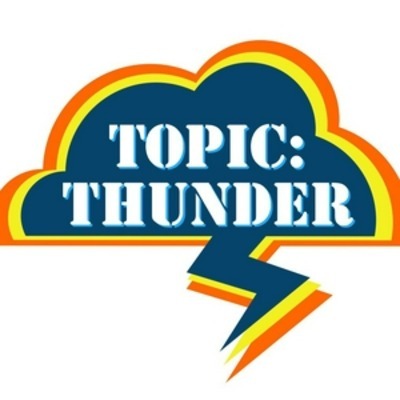 Topic: Thunder welcomes special guest Fred Katz! We're very happy to present a conversation with one of the inspirations for our show, the current beat writer for the Washington Wizards for the Athletic, the former host of Thunder After Dark, Fred Katz! The Thunder overcame yet another terrible night from Russell Westbrook and pulled out a victory against the (injured) Los Angeles Lakers. The defense was great, Russ made his presence felt in other ways, and most of all, Paul George was spectacular. Thunder Up. Russell Westbrook and OKC responded to their loss from a night ago to this same Dallas team as the Thunder set a franchise high in turnovers forced (29). In case you missed tonight's action due to New Year's Eve festivities, don't fret. Matty Mulls has got you covered!!! Behind Russell Westbrook's best performance of the season and a surprise contribution from Abdel Nader, the Thunder survive this game against the Phoenix Suns, 118-102. The Thunder had it going early in this Christmas Day match-up against the Houston Rockets. But the offense sputtered late and the Rockets' other players got their open shots to fall and the Thunder lost, 113-109. Game 32 Recap - The Thunder had their chances, lose to the Wolves 112-114. The Minnesota Timberwolves had some help, but the OKC Thunder still had their chances. Thunder lose to Minnesota 112-114. Stephen Dolan with the recap, and an additional Forecast and Player of the Week award. There won't be a Weekly pod this week, with the holidays, but we'll still get you all your information between this recap, and the Christmas day recap. Enjoy! Thunder defeat the Jazz in a game where A LOT happened, moving them to first place in the West alongside the Nuggets! The Thunder's starters completely owned the Kings tonight. Actually, they had to, with Schröder and Felton sidelined. Stephen and Dylan hit you with the recap. Enjoy! Thunder beat Bulls 121-96! Dylan is here to talk about Russ Triple Double, PG hot fire, Adams dominance, JG’s growth, Hamisplosion, Dennis’s importance, the fight that came out of nowhere, and more! Dylan and Stephen talk the 2-2 week for the Thunder, PG’s Stellar Play, Adams All-Star Buzz, JG’s Ceiling, Russ/Dre Injuries, Trades trades trades, Forecast the coming week and more! Russell Westbrook shoot poorly, but that's about all he did poorly! Stephen and Dylan discuss what went wrong, how OKC could have done better, and where mistakes were - oh wait, the Thunder won! Hooray! This might not have been one the Thunder should have won, but it was one they could have won. They did not. Anthony Montero with the recap. OKC is on the road in New Orleans. Russell Westbrook just wasn't himself in this one (possibly sick?) but the Thunder fight to stay in it. They have a few chances late but just can't get the shots to fall. Did you miss the game? Want to know what happened? Who took the possible game winner (not who you'd think)? Well, "Hook up the TiVo" as Matty Mulls catches you up! We here at Topic: Thunder are very pleased to bring you an interview with the Tweetgood Mac, @SnottieDrippen on Twitter, James Holas. He's a long-time Celtics fan officially, but an adamant advocate of Russell Westbrook, with a history of appearing on your favorite Thunder podcasts. We're thrilled to have him. Enjoy! OKC gets revenge on Utah with a 122-113 victory, that saw PG score 31 on 10 shots, Russ Triple Double Struggle, Adams control Gobert, Dennis/Noel/Hami show their worth, and more! T:T - The Weekly, Episode Eleven - Stop copying Russ! Welcome to the eleventh Weekly! We do the usual TiVo, Player of the Week, and Forecast. We also discuss potential trades for Khris Middleton, the humorous struggle of Houston, and Dylan gets hit in the head again! Enjoy! Well that was disappointing! Regardless, we promise you won't be disappointed by the recap! We're here to be bummed with you. Thunder Up! Russell Westbrook notched his 108th triple-double of his career but wasn't even the best player on the OKC Thunder in their dramatic win on the road over the Nets. Paul George had ice in his veins as he tallied 25 fourth quarter points to eventually bring home win number 16 for the Thunder. Give this a listen to find out how it all went down! OKC Thunder use balanced scoring and tenacious defense to oust the Detroit Pistons! T:T - The Weekly, Episode Ten - Ooooh, we're a quarter of the way there! Thunder fans, the season is a quarter of the way over! We've got a great quad for you on this Weekly, where as always, we Hook up the TiVo, name the Player of the Week, and provide the Forecast. This week, unfortunately, we also have to do an I Can't Feel My Legs to go over injury news, but we go through the NBA and OKC first quarter awards to make up for it. Enjoy! The Thunder put together quite the shooting display to dispatch the Atlanta Hawks, 124-109. Game 20 Recap: Russ is Historic, OKC Throws a Block Party/Thunder rolls 100-83. A combined 46 points from Colin Sexton and Jordan Clarkson weren't enough for the Cavs to keep pace with OKC as the Thunder handled business, 100-83 at home. Russell Westbrook had a MASSIVE game (23 points, 19 boards, 15 assists) and the Thunder set a season high in blocks (11). Deonte was hot, Alex was not. Give us a listen and find out what took place in OKC's 13th win of the season! T:T - The Weekly, Episode Nine - We (were) on a roll! Thunder fans! We're back with the T:T Weekly. Stephen and Matty go through the Thunder's last five games, name the Player of the Week, and go through the ridiculous Western Conference. And the Forecast this week looks clear and mild! Enjoy! Game 19 Recap - OKC lay down for the Nuggets. The OKC Thunder lost 105-98 to the Denver Nuggets, and it wasn't really that close. Stephen is on the recap for this one, with locker room audio from Steven Adams, courtesy of Alex Roig! Try to enjoy! Game 18 Recap: The Thunder buzz by the Hornets, 109-104, and into a tie for 1st place in the West. The Thunder were down a couple of wings, but still found a way to keep the scorching hot Kemba Walker at bay, and come away with a season sweep of the Hornets, winning this one 109-104. Stephen and Matty go long on the Thunder's victory in Oracle, how the Thunder can finally win these games with Russ having an off night, how injuries are sad and - BREAKING NEWS - how Hami's injury actually isn't "severe!" Enjoy! ThunderChats breaks down Russell Westbrook’s return, missing pieces, rough shooting night, and more in the Thunder’s 117-113 loss to the Kings. What's up Thunder fans? In this Weekly episode, we try something interesting: recording live during the victory over the Suns! We also do our usual recap of the previous week (Hook up the TiVo), general NBA discussion, Forecast the week to come, and name our Player of the Week. Bonus, a Hogwarts-style Sorting Ceremony of the Thunder players. Enjoy! The Thunder won AGAIN. We've been doing good lately, winning 10 of the last 11. Stephen, Dylan, and Alex are ALL on this recap. Enjoy! The team on the prairie lit up the team from the Big Apple. OKC moved the ball well, shot the ball well, stopped the Knicks from doing the same and rode Paul George's efficient 35 points to victory. Give this episode a listen to see how it all went down! ThunderChats recap of the Thunder’s 118-101 victory over the Phoenix Suns! The Topic: Thunder crew looks back on a week where the Thunder started off streaking, but ended up with a loss. We talk about what is different about this team this season as compared to last season in relation to the loss of a player like Westbrook. We look forward to the week ahead, which features three games against likely lottery teams. And we discuss the Jimmy Butler trade and the likely release of Carmelo Anthony from Houston. Game 12 Recap - Dallas is still the Thunder's little house of horrors, losing to the Mavs 111-96. The Thunder broke a franchise record for offensive rebounds in a game because....(news flash) they missed a ton of shots. The Thunder struggled to defend the pick and roll and struggled to consistently hit shots, which led to an ugly defeat at the hand of the rival Mavericks, 111-96. Recapping convincing victory over the Rockets, player of the game, most impressive unit, and more! It wasn't the prettiest, but it was still a W. The Thunder went into Cleveland without Russell Westbrook, and beat the Cavs 95-86. It's the sixth weekly, and the first truly happy one. The Thunder are coming off an undefeated week, and are facing a tough week, but it's finally time to be optimistic. The Thunder use a huge 2nd quarter to achieve their fourth consecutive victory over the Washington Wizards. Player of the game, Most impressive unit, and what I’ve learned over the last 8 games! Showing some grit in the fourth quarter, the Thunder were able to pull of a third straight victory over the Charlotte Hornets. Most impressive unit, player of the game, and freaking out over how awesome Russell Westbrook is. Hope you enjoy! Thunder up! The Thunder picked up their second-straight W! Check out this recap for a game summary, the best Unit from the game, the Player of the Game, and more! Thunder up. During this fifth weekly episode, Dylan, Alex, Matty, and Stephen cover the league, the Thunder's last week and next week, discuss trades, and hope the Thunder are on their way back up from rock bottom. Enjoy! The thunder lost three times and won zero times, but there are absolutely extenuating circumstances and soothing statistics to talk about. Stop panicking. We're not panicking, you're panicking. Welcome back to T:T.
On the latest episode of the Topic: Thunder podcast, we interview comedian Juice Deason, who will be hosting the upcoming Why Not? comedy show. In addition, he's Russell Westbrook's best friend. Russ played! (Yay!) OKC lost again (doh!) Although the result wasn't great, the Thunder are still growing. Did you hear that sound? Yeah, that was another wide open 3 clanking off the rim. Hey, at least we're good at rebounding! Let's get you caught up on what you missed in this one! Well, (spoiler alert) the Thunder lost again, bringing them to 0-2 without Russell Westbrook. The record without the MVP, though, isn't as disappointing as the performances of PG and Schröder. There are some silver linings, though. Let us tell you about them. In this episode of Topic: Thunder, we have actual, real-life, honest to goodness NBA games to preview. And doing one better, we go ahead and preview the rest of the league, too. Brady Trantham, @BradyDoesSports, of The Franchise joins us to talk about the preseason, forecast the regular season, and share his insight from his exceptional access. Enjoy! Dylan and Alex run through the Thunder's overtime victory over the Milwaukee Shmucks in the final preseason game. They talk about PG, Schröder, Noel, and - oh yeah - Hamidou Diallo. Enjoy! OKC Thunder VS Trae Young and the Hawks, preseason recap. In this, the second Weekly Episode of Topic: Thunder, we discuss what happened in the first two preseason games, name our first Player of the Week, get sad about injuries, and preview the Northwest division. Enjoy, and Thunder Up! Welcome back to Topic: Thunder! This is the second preseason game of the 2018-2019 season! The five of us will rotate to guarantee you people one of these for every. single. Thunder game. Enjoy! Welcome back to Topic: Thunder, but to the first ever Recap Episode! The five of us will rotate to guarantee you people one of these for every. single. Thunder game. Enjoy! Welcome to the first episode of Topic: Thunder! In this one, we talk about media day, training camp, and what else is going on with the Thunder, we Forecast OKC's preseason schedule, and we offer up our preseason hot takes in our Cover Me! segment. Enjoy!